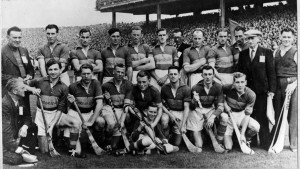 Tipperary v Kilkenny – 1916 to 2016: Part 4. 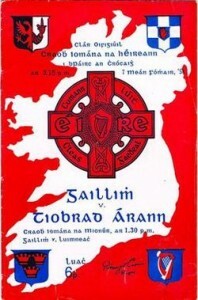 After the 1945 All-Ireland, Tipperary had some barren years as they were defeated in Munster by Limerick for three years in a row. John Mackey, brother of Mick and Paddy, played at right wing-forward for Limerick and is regarded as one of their all-time greats. He was Tipperary's principal nemesis in those years and was a lively and high-spirited character. The story goes that one year he ran into goalie Jimmy Maher, by no means a tall man, patted him on the head and said, "You haven't grown an inch since last year, Jimmy". 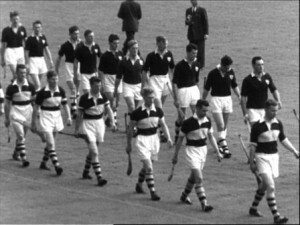 It would be five years before Tipperary (pictured above) and Kilkenny met again in a championship match. This 1950 final was played on 3 September. 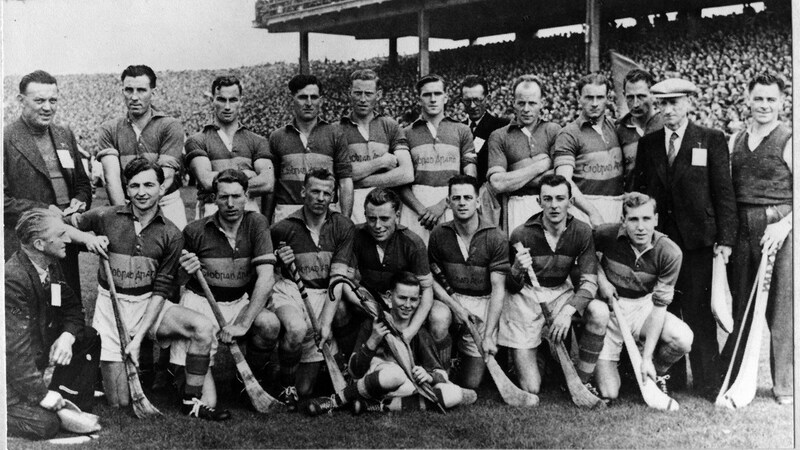 Tipperary were the reigning champions, having defeated Laois by 3-11 to 0-3 in 1949 for an easy victory. But the 1950 final turned out to be a much different affair. At half-time Kilkenny were leading 0-7 to 0-5 despite having played against a gale-force wind and glaring sunshine. The omens were not good, but Tipperary fought back strongly in the second half. Kilkenny did not help themselves by trying to score goals when points were there for the taking. 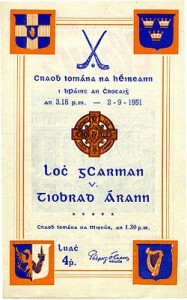 Then a minute from the end Paddy Kenny, of Borrisoleigh, scored Tipperary's only goal to put them ahead by four points. The cheers were ringing around the ground until Kilkenny then managed to score their own goal from all of seventy yards out. If Kilkenny could secure the puck-out a draw seemed very likely. 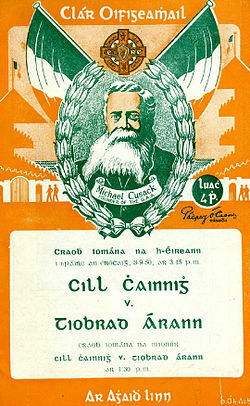 But referee Con Murphy, of Cork and later GAA President, blew full-time. Kilkenny, who had themselves won six previous titles by the minimum margin, lost this time by a single point on a score of 1-9 to 1-8. And Toomevara's Shanahan brought memories back again. And our star man Jimmy Kennedy as yet with U.C.D." In fifty, 'twas Sean Kenny's men, who kept the 'Cats' in line. And brought sweet victory home once more to the gallant hills of Tipp." Who trained our gallant hurling lads who wore the gold and blue. We'll keep your memories evergreen in the vales and glens of Tipp." Boherlahan's Paddy Leahy was chairman of the selectors for eight All-Ireland victories for Tipperary between 1949 and 1965. He had replaced his brother Johnny as a selector in 1949. Johnny died in 1949. Paddy remained in this role until his own death in 1966. His fellow club man, Philly O'Dwyer, joined him as a selector in 1958 and served until 1968. Tipperary and Kilkenny did not meet in the championship again until the All-Ireland semi-final of 1958. Galway had received a bye to the final without playing a single game, and this match was seen as the de facto All-Ireland final. Tipperary beat Kilkenny by 1-13 to 1-8, and went on to capture their 17th title with a score of 4-9 to 2-5. Back Row: Phil Purcell, Flor Coffey, Sean Kennedy, Tony Reddan, Phil Shanahan, Jn Doyle, Tim Dwyer, Sonny Maher, Seamus Bannon, Tony Brennan, J J Callanan, Gerry Doyle. 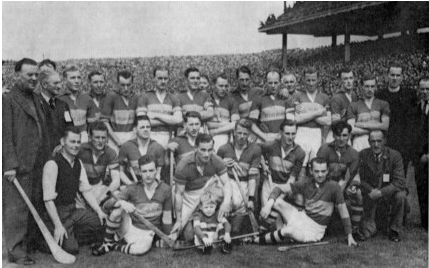 Front Row: P Leahy, Tommy Ryan, Mick Ryan, Mick Byrnes, Pat Stakelum (captain with P Caplis, mascot), T Doyle, Jimmy Kennedy, Jack Ryan. Coming in Part 5: Up to 1971.